We understand how difficult it is to find a sharpening company you can trust to do the best for your scissors and clipper blades, not to mention being without them for days on end. This is the very reason we offer you the option of having your scissors and blades sharpened at your premises or at home. When sharpening clipper blades, we like to see the clipper machine at the same time. 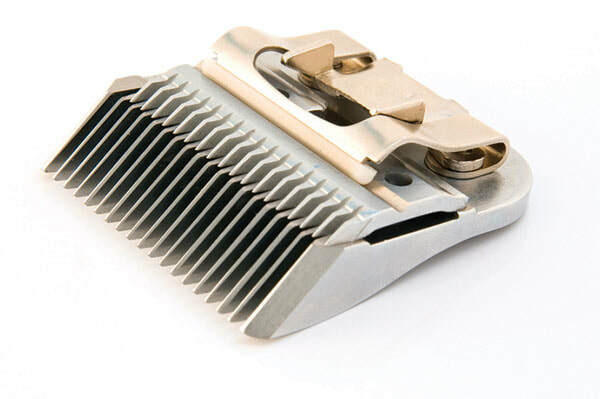 As part of our service, we check the clippers for obvious defaults like broken, worn or missing visible parts and remove hair/fur blocking the filters to allow better airflow. Once the blades have been sharpened, they are fitted to your machine and tested, so you can have confidence knowing they will work when you start clipping. Looking after the health of your hands is essential, especially if you are a full-time groomer. Using sharp, balanced scissors reduces unnecessary strain on the hand muscles. We are happy to show you how to test them for sharpness and also how to balance them. Regularly balancing your scissors maintains their performance, protects the cutting edges and most importantly, safeguards the health of your hands. The price is the same whether your scissors are straight blades, thinners or lefties. Grooming scissors typically take anywhere from 10-20 mins per pair and clipper blades about 5-10mins each. How can I get my blades sharpened? Call us to book us to visit your yard, salon or home so your equipment is sharpened then and there with minimal wait time (there is a £50 minimum order for this service). Bring your equipment to us in Rochford and collect the next day. We normally have a 24hour turnaround, so you wouldn't be without them for too long.